This is a delicious salad that works great on a buffet, for a Sunday brunch, for lunch or dinner. It takes no time to make and the flavors are really delicious. 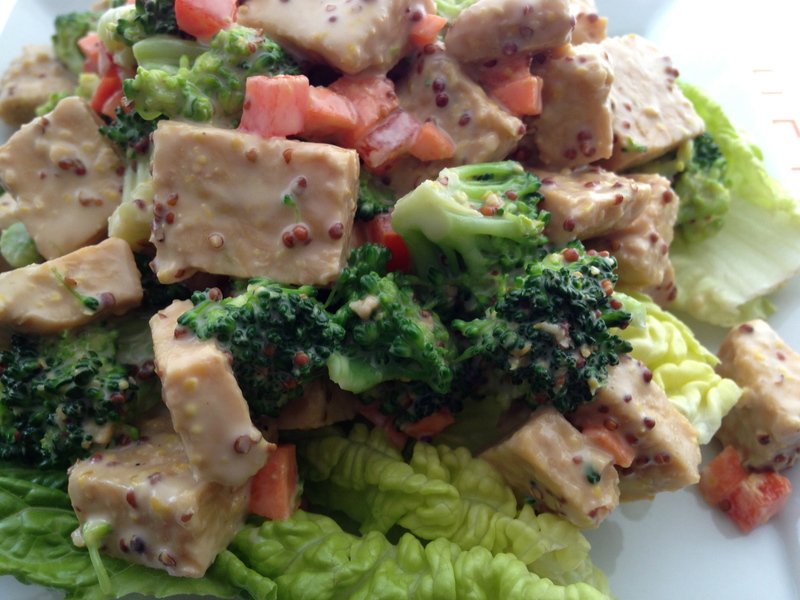 Mustard is the perfect accompaniment to the seasoned tempeh. Cut tempeh in half, half again, and then into bite size cubes. Steam in apple juice and tamari for 10 minutes. Let cool. Cut the broccoli into bite size florets and steam for two or three minutes until bright green. Immediately drain and either place in an ice bath or run under cold water. Dice the carrot and pepper into a very small dice. Mix the Vegenaise and mustard together. Season with salt and pepper. Place all ingredients into a big bowl and top with the mustard dressing. Toss well to coat. Taste and adjust seasonings. Serve on a big platter of lettuce leaves or individual plates. Enjoy!